The island council of Gaaf Alif Villigili has been accused of refusing to comply with an order by a magistrate court to change the wording on an Eid celebration banners. The banners put up on behalf of ruling Progressive Party of Maldives (PPM) Saud Hussain read, “MP Saud’s Eid Happiness.” The Maldives marked the religious holiday on Friday, July 17. The president of the main opposition Maldivian Democratic Party (MDP) Villigili branch, Ameez Hassan, filed a case against the island at the island’s magistrate court on Thursday, which ordered the pro-government majority council to change the wordings on the banner. Ameez told Minivan News today that he objected to the phrase “Saud’s Eid,” contending that the banner was un-Islamic. “Children see these banners, read them and tell their parent’s that this Saud’s Eid. So I realized these banners are confusing children and contradicts our religion,” he said. Ameez said he sued the council as the municipal authority’s permission was required to put up banners on the island. 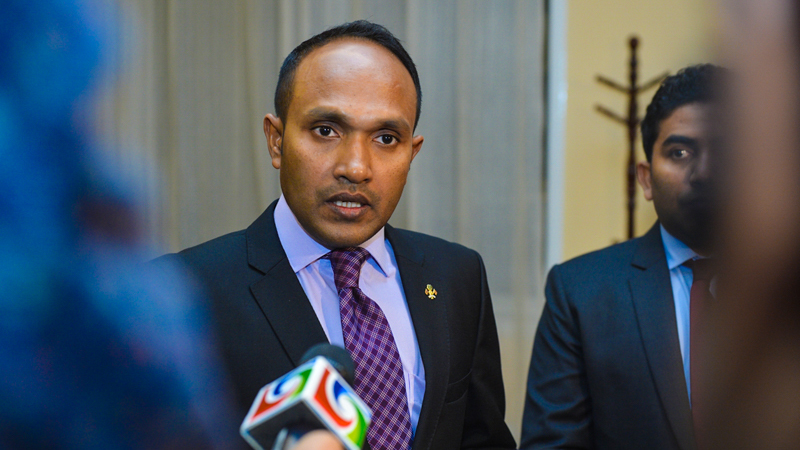 MP Saud meanwhile told Minivan News that he has complied with the court’s ruling. “The wordings have been changed according to the court’s ruling. This issue did not disrupt any of our festive Eid celebration activities,” he said. 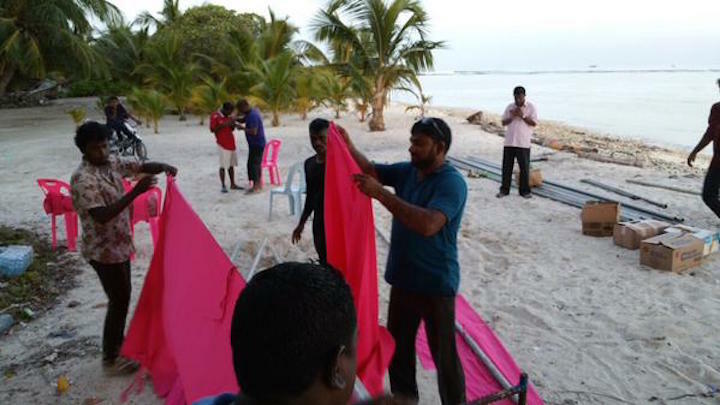 However, PPM councillor Fathuhy Moosa that the banners now read, “MP Saud Eid happiness 2015, Gaaf Alif Vilingili.” The Villigili island council consists of one MDP councillor and six PPM councillors. Ameez meanwhile said more banners have been put up since the court’s ruling, including one in front of the court. The wordings on the same banner near the island’s performance stage have also been enlarged, he said. Ameez accused the council of disrespecting the judiciary by “clearly disobeying” an order from the court. “I plan to take this matter to court as soon as offices open,” he said. The main opposition Maldivian Democratic Party (MDP) has warned that changes proposed to the national university law authorizing the president to appoint nine members to its council will compromise the university’s independence and politicise the institution. Government-sponsored amendments to the 2011 national university law was accepted for consideration with 43 votes in favour and 14 against at today’s sitting of parliament. Under the existing law, the president only appoints the chancellor of the university, who becomes the head of the governing council. If the proposed changes are approved, the president will appoint the chancellor, vice chancellor and deputy vice chancellors in addition to five members from outside the university to the 13-member council. The vice chancellor and two deputy vice chancellors are currently elected to the council while an independent committee selects additional members from candidates who apply following a public announcement. In a statement today, the MDP called on the government to withdraw the legislation and for staff and students at higher education institutions to protest against the bill. The party warned that politicising the university would pave the way for hiring and dismissing officials for political reasons as well as the “misuse of the university’s students, employees, and resources to achieve political purposes”. Politicisation would also prove an obstacle to the university’s academic research and dissemination of information, the MDP contended. The changes could also see the government dictate research topics and use the university to spread “propaganda,” the statement added. During the preliminary debate today, ruling Progressive Party of Maldives MP Ahmed Nihan said the changes were proposed to bring the governance structure of the national university in line with the recently established Islamic university. Apart from the PPM parliamentary group leader, other pro-government MPs did not speak during the debate in the interest of speeding up the legislative process. The government has also proposed changing the criteria for membership in the university council to allow non-Maldivians to become members. Council members must not be bankrupt or belong to a political party, the amendments state. The chancellor, vice chancellor, and deputy vice chancellors will meanwhile be appointed for a five-year term. The law presently does not specify a term limit. 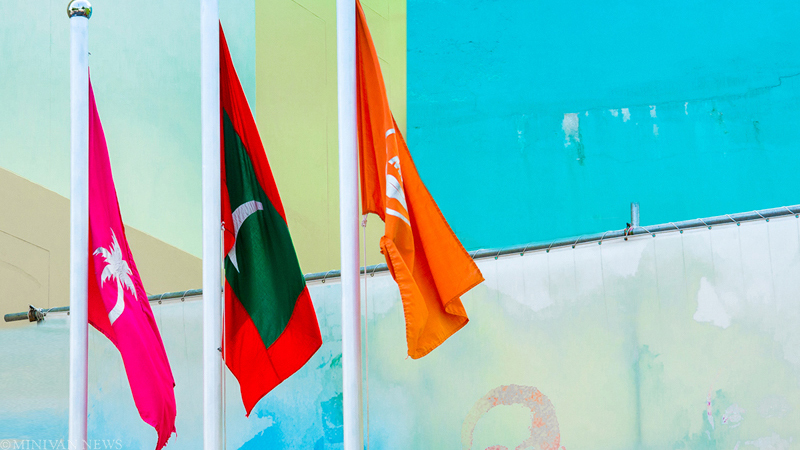 The Elections Commission has ordered all political parties, except the ruling Progressive Party of the Maldives (PPM), to re-register any member who may have submitted membership forms without fingerprints. The commission in a statement on Thursday said the 2013 Political Parties Act requires all political parties to submit fingerprints of members to register, and ordered all parties to submit membership forms with fingerprints by December 31. The PPM, formed in 2011, is not required to re-register members as all of its membership forms held fingerprints. The EC had first established the requirement for fingerprints in 2010, and it was enshrined by law in 2013. The main opposition Maldivian Democratic Party (MDP), the first party to register in the Maldives in 2005, has claimed the move is designed to reduce its members. With 46,608 members, MDP is the largest political party in the Maldives. MDP spokesperson and MP Imthiyaz Fahmy said the commission could not apply the law retroactively. 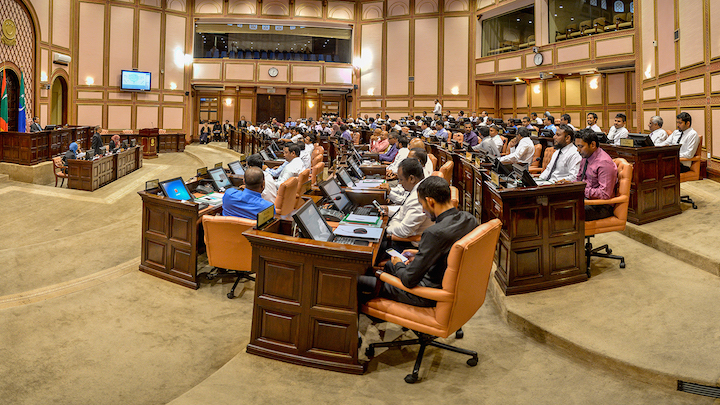 “The MDP was formed before the new act. Back then, a fingerprint was not required, so the membership forms are valid,” he said. He argued that article 8 (a) of the Political Party Act accepts any party with more than 3000 members before the law came into force as a registered political party. The requirement for fingerprints only applied to new membership forms. “This is a clear obstruction of the people’s constitutional right to join political parties. It creates an unfair burden on political parties and is designed to reduce our numbers,” he added. EC members were unavailable for comment at the time of going to press. Ahmed Akram, an EC member, told newspaper Sun that any members who did not submit forms with fingerprints will be removed from the political party registry. The PPM has 36,232 members. The Dhivehi Rayyithunge Party (DRP), from which the PPM emerged as a splinter faction, has 14,750 members. The Jumhooree Party has 13,990 members. The religious conservative Adhaalath Party has 9009 members. Political parties receive funds from the state budget every year. The amount depends on the size of the party membership. The EC has previously said it receives complaints from the public about being registered to political parties without their knowledge or consent. The commission has set up mechanisms to check party registration either through text messages or on the official website. A text message sent to 1414 with PPR space followed by the national ID card number would show if the person is registered to a political party. Alternately, the EC website has an online database to check party registration by entering the ID card number. The EC in 2014 fined the PPM, MDP, JP, Adhaalath Party and DRP for submitting fraudulent membership forms. The commission in September 2014 fined the Jumhooree Party for a ninth time after it discovered repeated fingerprints by 36 people on some 258 new membership forms. The PPM was also fined in March 2014, after it emerged that the ruling party had submitted forms on behalf of a dead man. The Anti Corruption Commission in 2012 interviewed 100 members of then-President Mohamed Waheed’s Gaumee Ihthihaadh Party (GIP) and alleged 85 percent of those polled had no knowledge of ever joining the party. Vice president Dr Mohamed Jameel Ahmed, in the first public response to his party’s attempt to impeach him, said he only fears Allah, and not the People’s Majlis or its MPs. 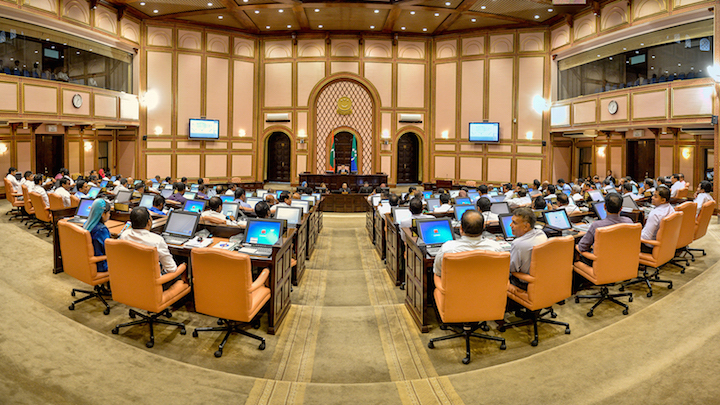 The no confidence motion submitted to the parliament today by 61 MPs is a motion submitted by MPs of the ruling Progressive Party of the Maldives (PPM) and their associates, and not by the people, Jameel said in a statement publicized on Twitter. “It is a violation of the people’s rights when a party or an organization, at their whim, without any legal basis, removes an officer directly elected by them,” he said. 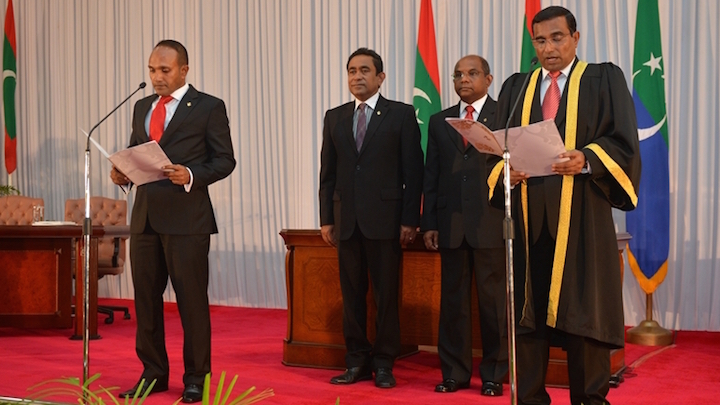 PPM MPs have publicly accused Jameel of incompetence and disloyalty. The ruling party is seeking to replace Jameel with tourism minister Ahmed Adeeb. Jameel, who has remained silent on the charges against him, today accused PPM MPs of greed. They have arbitrarily amended the constitution for their personal interests, he said. 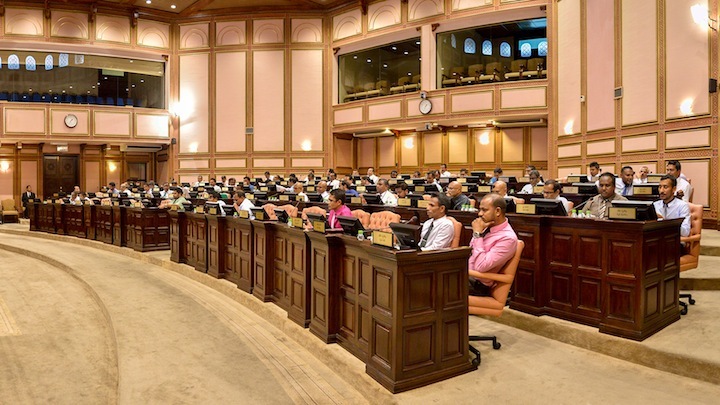 The parliament last week passed the first amendment to the constitution with overwhelming multi-party consensus to set new age limits of 30 – 65 years for the presidency and vice presidency. Adeeb is now 33. The constitution previously said candidates must be 35 years of age. The parliament yesterday approved changed to its standing orders to fast-track the process of impeaching the vice president. The new rules states the parliament can vote to remove the vice president without an investigation by a select committee. “The no confidence motion submitted to the People’s Majlis against me today is a no confidence motion submitted by the PPM parliamentary group and their associates. I say this because Article 4 of the Constitution states that all the powers of the state of the Maldives are derived from, and remain with, the citizens. The vice president is elected through a direct vote of the Maldivian public. It is a violation of the people’s rights when a party or an organization, at their whim, without any legal basis, removes an officer directly elected by them. Those who amended the constitution, in recent days, said the amendment was brought with the best of intentions and for the good of the nation. Their intent and motivation is now clear to the Maldivian people. The constitution, by the will of the people, dictates all the legal principles and the laws by which the Maldivian state must be governed. But, it is now very clear that all these principles, and the checks on power are being changed for a particular individual or in the interests of a certain group. The premeditated manner and the motivation behind the undermining of the powers of the people and the changes to the governing structure are now apparent, the deception is clear. Although all the powers of the state are derived from the citizens, it is now clear to the Maldivian people that an individual or an organization will use their powers to abrogate a decision made through the direct vote of the people. There is no reason to think they will not do so again. In this holy month of Ramadan, the Maldivian people and the nation are witnessing the greed of a few. The leaders of this attempt to undermine the people’s powers must remind themselves of the powers of the almighty and omnipotent Allah. I seek strength from Him. I only fear Him, not the People’s Majlis or the Members of Parliament. The constitution states that the vice president must be given a 14-day notice and the right to answer the charges before the resolution is put to a vote. Minivan News was unable to contact Jameel at the time of going to press. 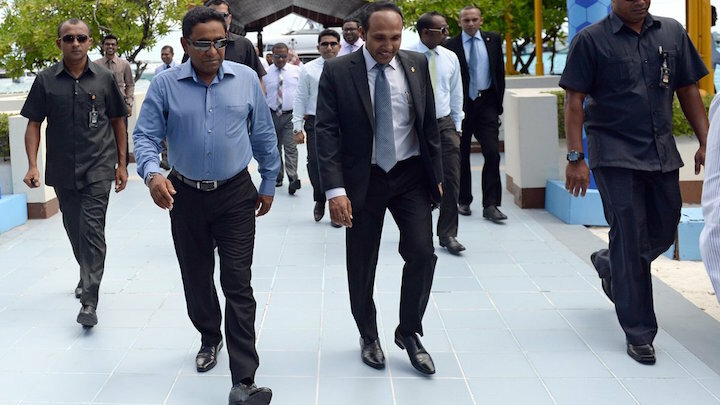 Jameel left to Sri Lanka after President Abdulla Yameen authorized a medical leave. A senior PPM MP told Minivan News yesterday that Jameel was due to return three days ago, but instead departed for the UK without informing the president’s office.